The University of Wisconsin-Madison Lakeshore Nature Preserve is a 300-acre natural area situated on the south shore of Lake Mendota on the University of Wisconsin-Madison campus. It represents about one-third of the total acreage of the main UW-Madison campus and includes 4.3 miles of Lake Mendota shoreline. The famed Lakeshore Path extends the full 4.3 miles along the Lake Mendota shoreline from the Limnology Lab, near the Memorial Union, to Wally Bauman Woods, next to the Village of Shorewood Hills, via Picnic Point, a peninsula that juts nearly a mile into the lake. The beauty of the UW-Madison campus is renowned world-wide. 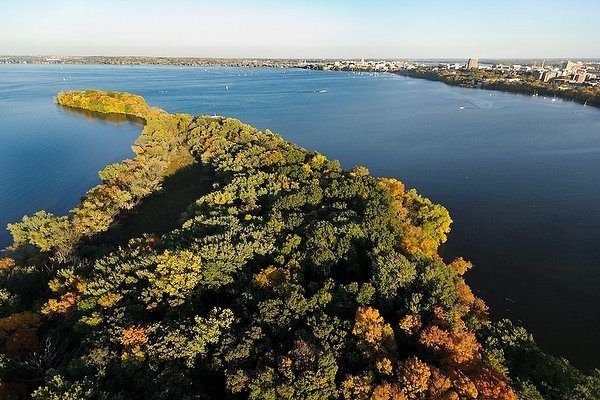 Much of what makes the university so distinctive is its relationship to Lake Mendota, which means that the Lakeshore Nature Preserve is responsible for preserving some of the most celebrated features of the campus. It is the physical connecting link from the campus to the lake. Part of the mission of the Preserve is to serve as a living classroom laboratory for the teaching and research needs of the UW-Madison as well as a place for campus and community members alike to explore nature on the UW-Madison campus. Only Muir Woods at the eastern end of the Preserve was originally part of the university campus. Lands farther to the west were acquired over many decades, sometimes on purpose, sometimes by generous gifts of university alumni and other benefactors. Until the early 1940s, even Picnic Point was private property, and only in the 1990s (with an extraordinarily far-sighted and generous gift of the last remaining parcel of non-UW shoreline property by the Frautschi family) did the university come to own the continuous 4.3-mile corridor of green. In 2004, these separate parcels were renamed the Lakeshore Nature Preserve, and the university is now committed to their permanent protection. In 2006 the first master plan was completed to ensure the protection of the Preserve’s distinctive natural features and to increase enjoyment and understanding of visitors. The Lakeshore Nature Preserve is managed by UW-Madison Division of Facilities Planning & Management staff. Policy guidance is provided by the shared governance Lakeshore Nature Preserve Committee. How can I visit and explore the Preserve? Picnic Point and the Lakeshore Path are the most well-known places in the Lakeshore Nature Preserve. You can use this website to explore more places in the Preserve and it’s rich cultural and natural history. You can visit us in person with the help of the Getting Here and Parking page. Also browse the in the Preserve page to get ideas for your visit. How can I get more involved with the Preserve? Volunteers are always welcome, no matter your background or experience. See our Volunteer page for more information. You can also become a member of the Friends of the Lakeshore Nature Preserve, a non-profit organization for everyone who cares about this special place. The Friends conduct regular field trips, participate in volunteer activities, publish a members newsletter, and generally do wonderful work to make the Preserve a better place. What if I want to offer financial support? Thank you! Please join the growing community of donors who sustain the Lakeshore Nature Preserve across the seasons and generations, year in and year out. Please see our Donate page for details.